I will never understand how people from the East coast or Midwest think that southern California has no seasons. Yes, I understand the lack of snow, the trees not turning dramatically red and gold and all that. But you can’t say to a gardener that we have no seasons. We do, and they are discernible. It’s late May and roses are getting ready for their second round of bloom, lavender is budding, trees are either newly leafed or leafing, flowers and fruit are forming on nearly everything. In the natural world, everything says, “Go!” I feel it too. In spring my engine is revved – spring makes me want to start something. It makes me want to dig and plant and cook. Two favorite plants in my garden are looking especially good: hydrangeas and blueberries. Both remind me of my grandmother, Sarah Cook. She grew big fluffy puffballs of hydrangeas just below the living room window at her home on Vancouver Island, British Columbia. My sisters and cousins and I kneeled or stood, depending on our height, on the cushions of the living room couch, looking out the big picture window at the top of the tallest hydrangeas. We watched gigantic spiders spin elaborate webs between the leaves and the flowers from a safe yet inquisitive distance. Grandma’s hydrangeas came in both blue and pink, but it was the blue I loved. The blue color doesn’t come naturally in Santa Barbara because our soil is too alkaline. I’d have to add aluminum sulfate to change the pale pink to blue, and since I’m a lazy gardener and the pink is still pretty, I leave them be. 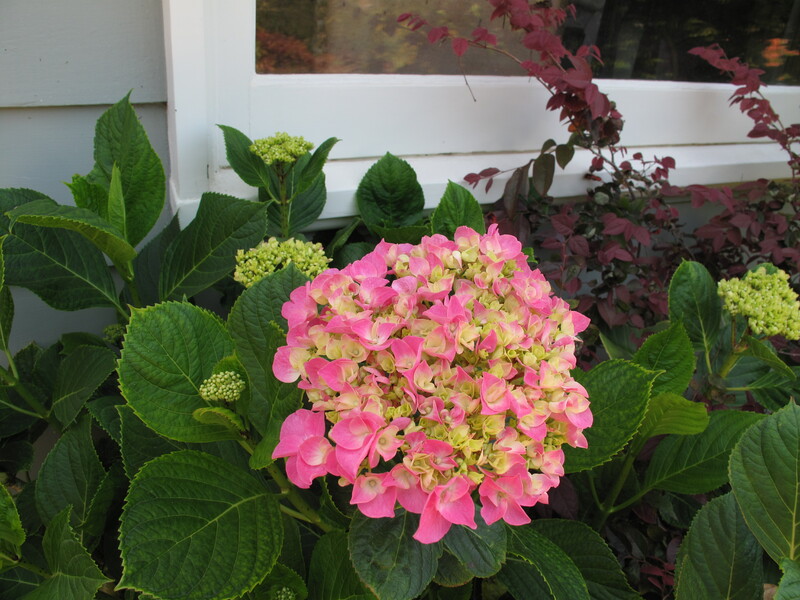 I’m just happy to be able to grow any hydrangeas. They need a lot of water, so I plant them on the north or east side of the house, where it’s cool and shady. Blueberries were not grown in southern California when I was a kid, but now several varieties of high-bush blueberries have been developed to grow here. We’ve planted three varieties, two of each kind, and they are thriving in a bed of fluffy well-composted soil (thank you, chickens) with extra peat moss added. Having several different types of blueberries together is supposed to help their pollination. Nothing gives me a thrill like going out in the morning to pick a few sweet, plump blueberries for breakfast. There’s not enough for a pie yet, but I am hopeful for the future. They are as delicious as any I’ve bought at the farmer’s market, and the bushes look so happy here. My grandma made fantastic pies of all kinds, and in the summer when we visited, she was partial to blueberry or huckleberry. We picked the red and blue huckleberries on a nearby mountain; what couldn’t be made into pies got put in canning jars. Blueberries were purchased at the store and good ones easy to come by, as they grow wild in parts of British Columbia. Huckleberries are impossible to find here, though I’ve seen them growing in Northern California. So I will make do with my blueberries – blueberries and huckleberries are cousins, anyway. Isn’t it funny how we continue to love the things we loved as children? The taste of blueberries; the look of hydrangeas in the landscape. That little bit of Canada here in coastal California thrills me. This pie is a lot like Grandma used to make, minus the Crisco. I usually bake with spelt flour, an older, non-hybridized wheat cousin that we find is easier to digest, but wheat flour works well here too. Mix flours and salt. With a pastry blender or 2 knives, cut in the butter, until the mixture resembles tiny peas. Sprinkle water over the flour mixture a little at a time, and mix lightly with a fork, using only enough water so that the pastry holds together when pressed into a ball. Handle carefully – don’t worry about getting every little scrap of dough into the ball, or it might get tough. Flatten the dough into a 7″ disc, then wrap in wax paper and chill for 1 hour. Preheat oven to 425 d. Have ready a 9″ deep dish pie pan. Divide the dough into 2 balls. Between sheets of waxed paper sprinkled with flour, roll out half the dough, to 2″ larger than the pan. Ease it into the pan, fitting it loosely but firmly. Roll out the top crust and set aside while you prepare filling. Wash and pick over the blueberries. Mix the sugar, salt and flour in a large bowl. Add the blueberries and lemon juice and toss well. Pile the mixture into the lined pie pan and dot with butter. 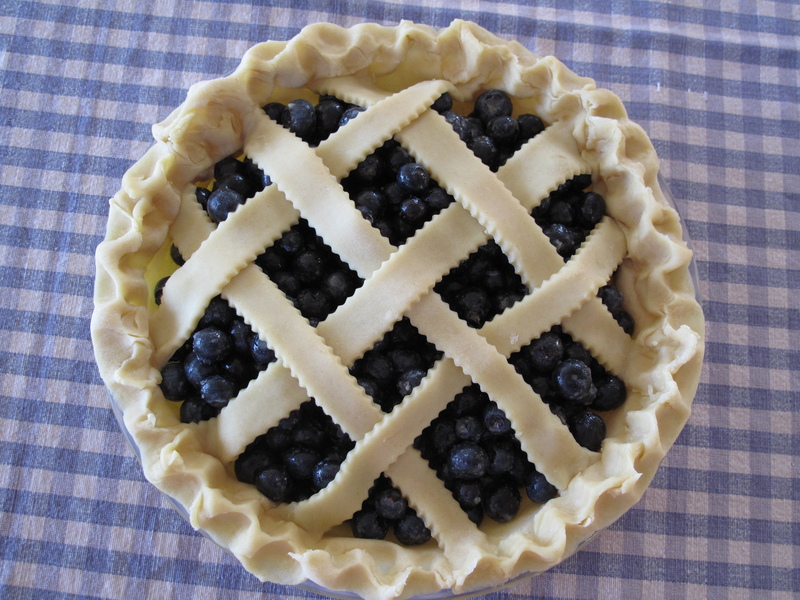 Drape the top crust over the pie, and crimp or flute the edges. Cut several vents in the top. Bake for 10 minutes, then lower the heat to 350 degrees and bake for 30-40 minutes, or until the top is browned. Let cool for about an hour before serving, so juice can set up. Recipe adapted from one in my cookbook, the Follow Your Heart Cookbook: Recipes from the Vegetarian Restaurant, by Janice Cook Knight, Wiley, 2005.